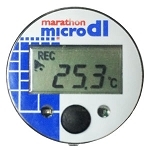 The MicroDL Data Loggers are the smallest temperature data loggers that incorporate an LCD display. Pushing the button on the face of the logger enables you to view real-time temperature readings, verify if temperature data is being logged, and cycle through displays of critical mission and alarm data. 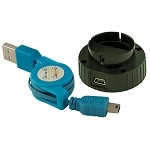 MicroDL with Internal Sensor - these self-contained loggers house the sensing element inside and are an excellent choice when the entire logger can be directly exposed to the environment being monitored. 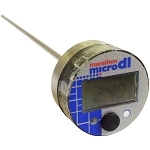 MicroDL with Stainless Steel Probe - these food grade probes are great for monitoring the internal temperatures of foods, fluid, and even soil. 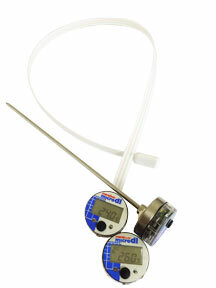 The addition of the probe enables monitoring in environments where direct contact with the main logger unit would be impossible or undesirable. Ultra-Low MicroDL with Flat Flex Probe - designed for dry ice and ultra-low freezer applications, this flat, flexible probe enables the logger's LCD display to be located outside the ultra-low temperature environment. 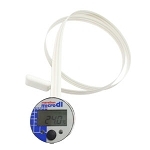 The MicroDL Connectivity Kit includes all necessary hardware and software for configuring MicroDL Data Loggers and collecting their sensor data. 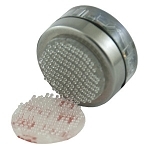 Reclosable Fastener Dots - A secure 2-piece reattachable mount. 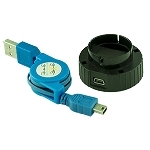 DS9096P+ - A low cost permanent adhesive mount.